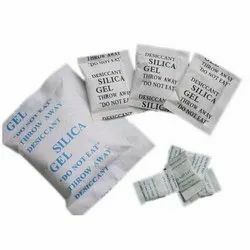 Offering you a complete choice of products which include silica gel. Packaging Size 2 gram to 0.5 Kg. Dry desiccant packs are mostly containers used to store different kinds of desiccants and adsorbents like Silica Gel, Activated Carbon, Molecular Sieve, Activated Alumina among others. Dry desiccant packs are available in different categories, depending on their use. These include cargo dry park (for shipping containers), pillow paks and unit packs. This dry pack makes use of various packaging materials like paper bags, cotton and polyester cloth bags, non-woven bags and transparent bag materials. The Dry desiccant packs containing adsorbents/desiccants is placed alongside products when they are being packaged. The packed goods may be transported for long distances and hence, it is important that they are kept in a moisture-free environment. Placing a cargo dry with the products will solve this problem as it will prevent the occurrence of phenomena like “container rain”. The main industries, which make use of dry paks is shipping, pharmaceuticals, electronics, Agri- products, stationery, and many others.Many commercial industries preferred self-moisture Indicating Type Silica Gel because its moisture absorbing capacity is very high then other desiccants and can easily indicate moisture when it free from moisture it can regenerate for the same application use. One of the silica gel - blue can indicate its moisture capacity, it absorbs 40% of its weight in moisture.